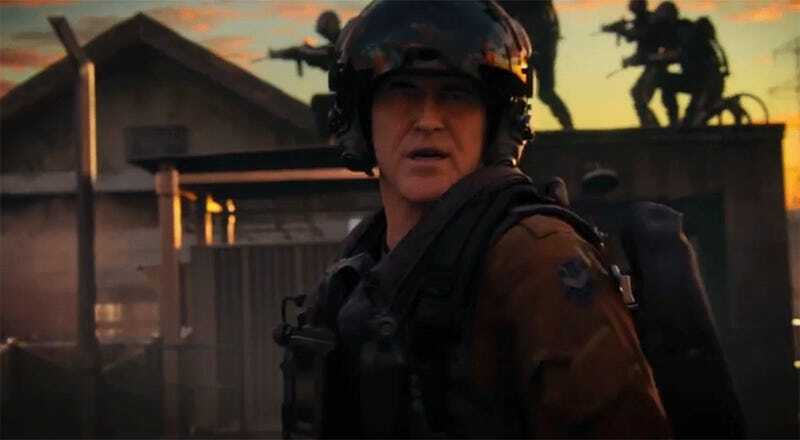 Call Of Duty: Advanced Warfare’s “Supremacy” DLC hits Xbox Live next week, adding Bruce Campbell to the lineup of playable survivors in the game’s Exo Zombie co-op mode. With only four slots, who gets cut? Yeah, “Supremacy” comes with four brand-new maps for folks who enjoy shooting at each other—Kremlin, Parliament, Compound, and Skyrise, a re-imagining of Modern Warfare 2’s Highrise. But I’m a co-op player, so I’m in it for the advancement of the Exo Zombies story, which left off last time with Bruce Campbell’s newly-introduced character pointing a gun at John Malkovich, Jon Bernthal, Rose McGowan and Bill Paxton, declaring that one of them had to go. In the new DLC trailer, we find out who that one is. Looks like John Malkovich’s Oz is out of the picture, replaced by a playable quip-filled Campbell in Exo Zombies Carrier. Expect tons of familiar one-liners as up to four players take the battle for survival to the high seas. I wouldn’t count Malkovich out just yet. McGowan says “shot,” not killed, and Oz is a tough old bird.